The breed Irish Red Setter was developed in Ireland in the 1700s from the Old Spanish Pointer, setting spaniels, and early Scottish setters. 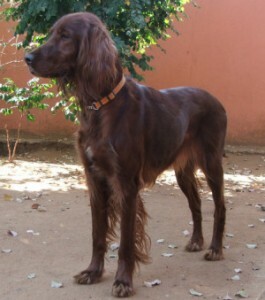 Early Irish Setters were white with red blotches on their coats, but today the Setter’s coat is a rich mahogany color. The Irish Red and White Setter is more closely related to those early Setters. The modern setter was first named in Ireland by Harry Blake Knox. The Irish Setter’s name in Gaelic is Madra rua or “red dog”. The Irish Setter was bred for hunting, specifically for setting or pointing upland gamebirds. They are similar to other members of the setter family such as the English Setter and Gordon Setter. Irish Setters are extremely swift, with an excellent sense of smell and are hardy over any terrain and in any climate. The Irish Setter is used for all types of hunting. It even works well on wetlands. The original uses of the irish setter were as a game retrieving & setting. The Irish Setter is also commonly found as a companion pet. This happy, playful breed is known for its joy of living and thrives on activity. It loves to run in wide open spaces. It is faster and has more endurance than other setter breeds. In general, Irish Setters are friendly, enjoy human company, and actively look for other dogs to play with. They are affectionate and like to be petted. Irish Setters are excellent with children. Irish Setters are not naturally aggressive, although can bark to protect the area from strangers. Anyone who has lived with them knows that these dogs are experts at getting their way! Irish Setters present a training challenge because they are stubborn, easily distracted, and quick to bore, but most of them are quite intelligent. It takes a great deal of patience and commitment to train an Irish Setter; however, such training is an absolute necessity, and it usually proves to be fun and rewarding for both dog and owner. Training must start early, and the trainer should keep in mind that most Irish Setters aren’t mentally mature until they are at least 2 years old. They require more exercise than do most other breeds, including a chance to run every day until they reach old age.